DETECTIVES IN CO Fermanagh are investigating after an ATM machine was stolen from a filling station in Irvinestown this morning. 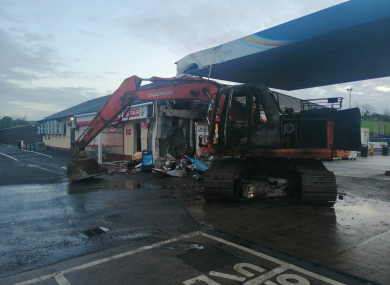 Police have said the thieves used a digger to remove the ‘built in’ cash machine from a filling station on the Dromore Road at around 4:05am, causing extensive damage to the building. The digger was set alight at the scene immediately after the ATM machine was stolen. Detectives are now investigating whether this morning’s theft is linked to a number of similar ATM thefts in border counties. Police have appealed to anyone who may have been in the area between 3.30am and 4.10am. Email “Investigation after thieves use digger to steal ATM from Fermanagh filling station ”. Feedback on “Investigation after thieves use digger to steal ATM from Fermanagh filling station ”.